1. How should I prepare a file for printing with you? The basic and easiest answer to this question is that you supply a PRINT READY PDF file. We recommended a minimum of 300dpi, converted to CMYK color space, all fonts outlined AND embedded. Specify your trim area with crop marks (Don’t place crop marks inside the work area). Make sure you have a minimum of 1/8” (0.125”) BLEED on all edges of your job, and a 1/8” (0.125”) SAFE area that has all critical design element such as text, pulled away from trim. 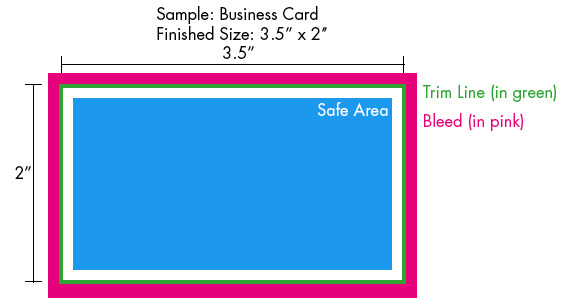 Information content (“Safe Area”) should be 1/8” (0.125”) away from the trim line. 2. How much bleed do you require? We require a minimum of 1/8” (0.125”) bleed on all projects. This will add 1/4” (0.25”) to your overall image area, on both dimensions. Below are some example layout files incorporating our templates available in our Product Templates section. In this example, if you wanted to print a 3.5” x 2” standard business card with the image all the way to the edge, you would need to submit a file 3.75” x 2.25”. Bleed is the extended image area of your print job, that prevents the unprinted paper from showing on the edges of your finished job. We require a 1/8” (0.125”) bleed, on all projects. It is not practical to print the image exactly to the edge of your finished product. Instead, the additional image area is printed past where the item will be trimmed. If the bleed is not provided on a document, the final result of a trimmed job may possibly result in a slight white border around the edge. The example below will illustrate why bleed is important. 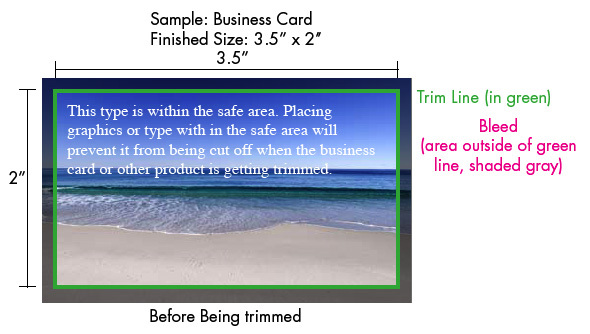 The safe area contains all critical elements/information of an artwork that cannot risk being cut off and is an area that is 1/8” (0.125”) from within the trim line. 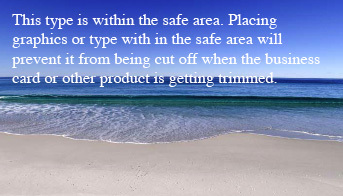 Generally, important information such as text, addresses, borders, and titles rest within the safe area. 5. What type of file format do you prefer? Adobe Acrobat (.pdf) - PREFERRED! A print-ready Adobe Acrobat (.pdf ) file. We recommend a minimum of 300dpi, CMYK color mode, all fonts outlined AND embedded. Make sure you have a minimum of 1/8” (0.125”) bleed on all edges of your job, and a 1/8” (0.125”) safe area that has all critical design element such as text, pulled away from the trim. ***These file types will incur a file conversion fee-based at our current hourly graphic design rate. * These file types may incur a file conversion fee. Note: We prefer that you send us a .pdf print ready file. For files created in Microsoft programs, you may have to download a free utility such as PrimoPDF (http://www.primopdf.com) to convert your job to .pdf form. Please understand that we are not responsible for how you convert these unsupported file types. Please double check your final .pdf before submission. If your job comes out incorrectly because of problems stemming from a bad conversion, we will not be responsible. 6. What if my project is in a format not listed? File formats that are not listed in our accepted formats, must be converted to an accepted format. For Windows users, there are many free utilities such as PrimoPDF (http://www.primopdf.com) to convert your job to .pdf form. Please understand that we are not responsible for how you convert these unsupported file types. Please double check your final .pdf before submission. If your job comes out incorrectly because of problems stemming from a bad conversion, we will not be responsible. 7. What do I do when I am ready to print? If you have checked your proof very carefully (please see Tips for Proofing) and you are ready to print we require for you to “sign off” on the item to be printed. You can “sign off” by e-mailing an approval by stating that the most recent proof is ready to print, fax us the proof with your signature upon it, or you can come see us and sign your final proof. Once you approve the proof you are responsible for any mistakes, including but not limited to misspelled words, missing type, the position of a graphic, etc.